It’s the time of year that people pause in their hectic lives to reflect upon what they are most grateful for, what has changed their lives in the past 12 months and what they hold closest to their hearts. This year, Concordance is doing the same. How can a COMPANY reflect and acknowledge things like this? Simple. Our company is our people, as we’ve said again and again; and this year we would like to acknowledge one of the people that made Concordance possible. 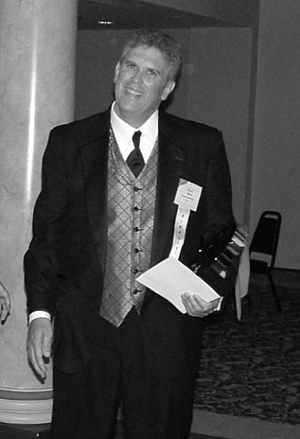 A person that has spent almost 29 years of his life changing the healthcare distribution industry for the better. He is a person that many of us hold near and dear to our hearts. As he prepares to retire on December 31st of this year, we want him to know how very thankful we are for all he has done to build our company, our work family and the endless book of stories about his shenanigans. 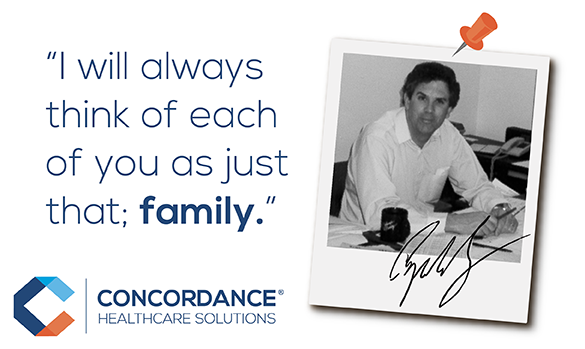 Roger Benz, current co-CEO of Concordance, is truly one-of-a-kind. Those of you that know him, know that he is full of knowledge, full of fun and possibly one of the humblest CEOs on the planet. What you may not know is the journey that he took to build Concordance and secure the bright future that we face. At the age of 32, with two small children, Roger and his wife, Deb, were offered an opportunity: to invest in an employee asset buyout of the med/surg business where his brother-in-law, Bill Schultz, was then employed. Like many decisions in the years to come, Roger and Deb went “all-in.” They sold their house in Dayton, Roger quit his job, they moved two hours north to Tiffin, Ohio, invested $25,000 into this new startup venture, and Roger officially became the CFO of Seneca Medical. 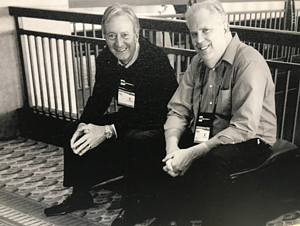 Roger and Bill lived off of credit cards for the first few months of operations and personally guaranteed all of the debt for the organization. Fifty employees followed them on this journey and as a team they opened the doors in February of 1990. Roger and his wife had taken a huge risk with their young family, and the risk paid off only after many years of hard work, scraping by and providing the absolute best service in the industry. Seneca Medical started with a mere $25 million in sales and at the end of 15 months, they were finally making a profit, which was shared with all their employees through their profit-sharing plan. The company grew and in 1998, Roger and Bill decided to start the Employee Stock Ownership Plan (ESOP) by buying half of the outstanding shares back from the shareholders and putting them into a trust for the employees. Seneca Medical employees now had both a short term (profit sharing) and a long term (ESOP) goal. Through these investments the company survived. Roger was (and still is) in charge of the coffee. Sure, some days he was a bone head (see above), but the team always had fun. They understood what it took to be successful, to keep the employees engaged and they always worked as a team. In the year 2000, Seneca Medical hit $112 million in sales. Roger and Bill decided to invest again and made their first acquisition of AmeriSource Medical Supply in 2001. A year later, Bill Schultz retired and Roger was named CEO. That same year he won the Ernst and Young Entrepreneur of the Year award. In 2005, Seneca had been in the black again for three years, their message was resonating in an area that had been saturated with national players. Due to these factors, Roger and the leadership team decided it was time to expand and opened a warehouse in Indiana even though they had no customers in that geography. In 2009, they expanded again in Michigan, aligned with the conversion of a new strategic customer. Then in 2010, Seneca lost a third of their total sales as a result of a losing a customer at their flagship warehouse in Tiffin. However, at the direction of Roger, the company did not layoff a single person. They fought through the rough months and eventually replaced the business with new customers. In the midst of this loss, Seneca opened yet another facility in North Carolina and began working to convert customers in that region. Under Roger’s direction the company started to get involved in charity events. They created teams and raised funds for MS Bike to the Bay, Relay for Life and many other organizations; often times with Roger leading the way in unique fundraising techniques (like the times when he wore bras and dresses to raise money for breast cancer research, in honor of a loved one. Employees could pay $1 to get their picture with him or pay $5 to NOT get their picture with him). In 2012, Seneca zeroed in on raising awareness about human trafficking, long before it became a common topic of discussion. Through conversations with survivors on all they had been through and had to overcome, Seneca’s leadership knew they had to do their part. Over the next four years, the company invited survivors to come speak at their annual meeting, raising awareness with their suppliers and the industry. They also donated more than $35,000 to organizations like The Soap Project, Survivor’s Ink, and Sisters in Shelter to help fight human trafficking. With great dedication to the cause, Roger joined the board of Sisters in Shelter and helped that organization gain 301C status and start a home for women who are rescued from trafficking. Roger jumped in whole-heartedly when it came to helping those in need, just like he did in business. Through all the years of growth and giving, Roger remained steadfast in his support of the employees and in the belief that the company could compete with any national distributor in the country. In 2016, Seneca Medical merged with MMS and Kreisers to create a near-national distributor; one with heart, one with soul and one filled with people who truly care about the customers they serve. 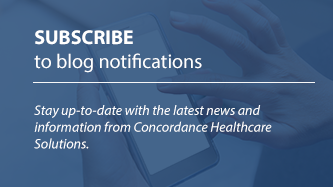 Through the leadership and vision of Roger, along with his counterpart Tom Harris, and the members of the Operating Board, Concordance was officially created. We are now home to over 1,100 employees, with 20 distribution centers across the country and an annual sales volume of over $1.3 billion. We have continued to expand our combined geography, adding facilities in Idaho, California and Texas. We serve the entire care continuum with the same dedication and hard work that Roger has committed to this company over the last 29 years. Roger will be the first to tell you that the employees are the ones that created this amazing company and that some days all he does is “herd cats.” While those statements may be true, he is very much the man that steered this ship through the calm and the storms. He is the person that so many have trusted and relied on over the last three decades. He is the CEO that has always put the employees first, has done what it takes to keep the company afloat and continues to stock the coffee in the break room. For all these reasons and many more, we are beyond thankful to have had the pleasure of working with, laughing with and being employed under the always awesome and ever-humble Mr. Roger Benz. We return that sentiment 100%. From all of us here at Concordance – we THANK YOU and we will miss you.